You'll find most of the Lunch & Learn sessions to be more than just helpful. There will, at times, be a guest speaker and teacher to help you with skills pertaining to marketing, the social media big 5 and sales in general. It's just a hop, skip and jump to learn some of the basics and get some in depth training with the lunch and learn sessions. Each of the sessions is designed around a theme so you know what you're getting with each session. Depending on what guest may appear the subject matter changes from session to session but some items may remain the same. What do you need help with? Let Lamar know and he can build in a segment for a future Lunch and Learn. It always pays to speak up and allow the project managers to help you learn. You'll be amazed at how much new knowledge can be put into one session. Hand-outs will help you retain much of what is presented during slide-shows and presentations by guest speakers. You may learn to use free Google tools that you were unaware existed before - and you will learn how to use them to your advantage. Although subject matter does change from one session to the next. 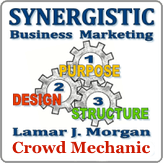 The Lunch and Learn Series is a product of Synergistic Business Marketing and Lamar J. Morgan. Although it's a place to learn it is also an event that gives you a great opportunity to meet other people and exchange ideas. As we all know, networking is an integral part of every small business. Not always the easiest thing to find time for, networking does help spread your message. At the Lunch and Learn sessions you'll have the opportunity for both! Lunch & Learn & Network! Lunch & Learn is a product of Synergistic Business Marketing. Lunch and Learn is a great networking opportunity too! 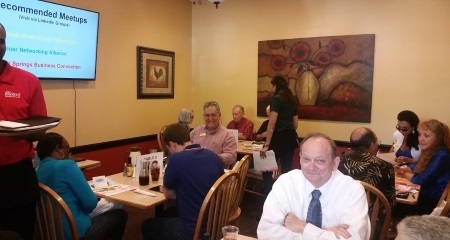 You'll be seated randomly with other guests so it will be easy to meet new people who may be working in your area. Find a person with skills you may need! Schedule Your Conference Call Meeting Time Today! Wichita KS - Derby KS - Kansas - U.S.A.